Click to print the Fad Forty game. 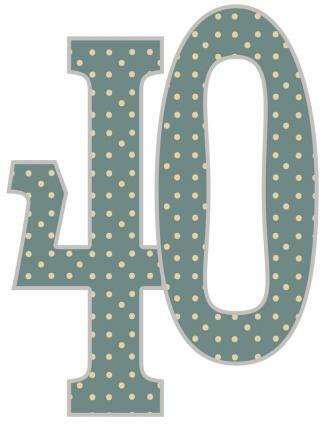 Games are fun for all ages, and 40th birthday party games are no exception! Whether the party is low-key or an all-out bash, plan for some appropriate games to allow the guests to mingle and provide the guest of honor with priceless party memories. It can be a challenge to think up party games that are fresh and new, and won't cause your guests to groan about having to play games. Keep in mind that games for an adults-only party will be different from those for a party where kids will be on hand, and plan accordingly. Not sure where to start? Try out one of these printable games that open using your Adobe PDF program -- or both! Fad 40 is a fun board game where you get to reminisce about fads of the '70s, '80s, '90s and '00s. Click the image above to get the game board, instructions, and clues. Cut out the 30 provided clue cards before you begin playing. Divide into two teams, using a coin as a marker. The host, who is not playing, will draw a card to begin gameplay. Follow the directions provided with the game to continue play. The team who reaches the End spot on the board first is the winner. Test guests on their knowledge of 40 using Fill-Ins and Who Said It? game. 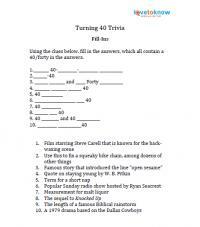 The Fill-Ins game provides clues to sayings, movies, and more that have a 40 or "forty" in the answer. Who Said It? is comprised of quotations about being 40 that need to be matched to the person who originally said the statement. Give each guest a copy of the clue sheets and keep the answer sheet to yourself. Next, set a time limit and have guests write in their answers, following the instructions provided on the printables. Whoever fills in their entire sheet first is the winner. If no one has it all filled out, reward the person with the most correct. For this game, print or clip pictures from magazines of celebrities that fall into a wide range of ages. At the party, show the pictures and ask your guests if the celebrity is older or younger than 40. You can have guests call out their answers, or give them paper and pencils to keep score. This is especially fun if you find photos of stars who look older or younger than they actually are. Click the 40 to open and print. Art Turns 40 is a more creative game and is best played in teams of two or three. Everyone plays except the guest of honor, who will serve as the judge. Print several copies of the attached 40 graphic and distribute one copy per team. To print, click the graphic and it will open in a new screen. Then right-click and copy the image to your preferred program for printing. Distribute art supplies, such as markers, glue, glitter, lace, googly eyes -- anything that can easily attach to paper. Give each group 10 minutes to make a creature using the 40 as a starting point. Have them come up with a name for the creature and a story about why it is at the party. Then, have everyone share their creatures with the guest of honor and he or she picks a winner. 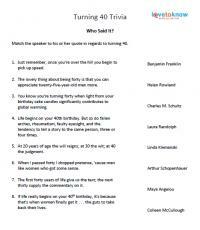 The 40th Birthday Game - Amazon sells this trivia card game with over 140 questions perfect for people turning 40. It retails for around $6. 1974 Trivia Challenge - This traditional playing card deck doubles as a trivia game, complete with artwork. Pick it up for about $7; look for future years after the next one rolls over. 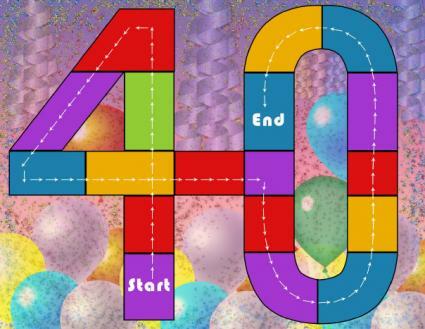 Python Downloadable 40th Birthday Games Pack - Get 20 different games geared towards a 40th birthday for around $20 at Python Printable Games. The pack includes games like Number 40 Trivia, Same Day Birthday Game, and Been There, Done That. Party games should be fun, most of all for the guest of honor, but also for all of the other guests who likely vary in age. In addition to the 40-themed games, set up casino games, poker tables, dart boards, and popular family board games. For games with team play, mix up the teams from time to time to allow guests to mingle.